Some casino games spawn from traditional family card games. There are many ways to vary card games. The more creative you get with the varying, the more interesting the game can be. One of these innovative and exciting games is Las Vegas 3-Card Rummy. It may seem a little odd to see a game like this on the Silver Oak Online Casino games list. 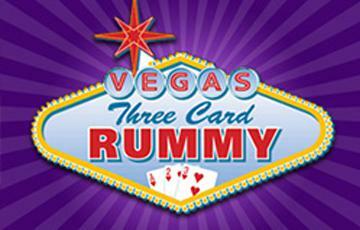 Nevertheless, Las Vegas 3-Card Rummy is a great game, and we recommend you give it a shot. In case it is just a little too confusing, read this short article on the game and get acquainted with Las Vegas 3-Card Rummy. Las Vegas 3-Card Rummy is played between a player and the dealer with one single traditional 52-card deck. The player is dealt three cards with the face up, and the dealer deals himself three cards face down. You must get fewer points than the dealer; that is the object of Las Vegas 3-Card Rummy. Once you learn how the point system works, this casino table game will quickly become one of your favorites when you see the big wins you can score. Click on the chips to ante up. You can also place a Bonus Bet by clicking on the Bonus Bet button and then clicking on the desired chip value, but this is optional. Click on the Deal button to begin the round. The player is dealt three cards face up, and the dealer is dealt three cards face down. If you deem you are capable of beating the dealer, click the Bet button to continue. The bet amount will be equivalent to the Ante and multiply your bet by two. Clicking the Fold button ends the round, and you forfeit the Ante and Bonus Bets. You can click on the Re-bet button if you would like to repeat the previous wager or wagers and deal the cards for a new round of play. The dealer will likely raise the bet. After raising, the dealer’s cards are revealed. The dealer’s hand must qualify for the round to continue. For the dealer’s hand to qualify, the dealer’s hand must contain 20 points or less. If it does not, you win even money on the Ante and the Raise wager is returned to the dealer. If the dealer’s hand does qualify, it is then compared to the player’s hand. The winner is determined by who has the smallest point total in their hand. If the dealer has the lowest point value, then you lose your Ante, Bonus and Raise bets; if the player has the lowest point value, the Ante is paid 1:1, and the Raise bet is paid according to the pay-table. If your point total in your 3-Card Rummy hand is less than the dealer’s total points, or if the dealer did not qualify with 20 points or less, then you win your Ante and Raise bets. You win your Bonus Bet, if you played it, when your card total is 12 points or less. The Bonus Bet is a non-obligatory wager that is added during the Ante phase of the game. If you would like to add a Bonus Bet, click on the Bonus Bet button and then on the desired chip value and resume the round of play. You win this bet if your hand contains 12 points or less. The Bonus Bet is not gauged against the Dealer’s hand, it is paid out based on your hand’s total point value. If you fold your hand, you also forfeit your Bonus Bet. The game is actually quite simple. Once you get the hang of the point system, the game is very easy. We recommend you work with the Bonus Bet feature. Fiddle around with it and balance out the best way to maximize your winning odds. Most of all enjoy playing Las Vegas 3-Card Rummy!